Although summer months bring a unique opportunity for you to enjoy some quality time and outdoor adventures with your furry companion, the rising temperatures during this time of year can also lead to a myriad of problems that could be potentially fatal for your faithful friend. In this article, we’ll be reviewing a few simple and proven strategies to keep your dog cool and prevent issues like: dehydration, heat stroke, or overextertion. Exercise your dog in the early morning or afternoon. When the temperatures start rising most dogs cannot withstand the mid-afternoon heat. Take your pet on an early morning or late afternoon walk to make things more comfortable for them. Playing during these times is acceptable, just watch for signs of overheating. Vigorous exercise is great but in the summer months, it is better to lessen the intensity. Shaving your dog in the summer may seem like a great idea especially if they have long hair and a double coat. However, shaving a short haired dog is not necessary; it actually does more harm. If you have a dog breed with long hair you may need to do a little research; some breeds hair may never grow back the same after shaving it off. Most of the time you only want to trim their hair down and be sure to leave at least an inch. This leaves enough hair to protect them from UV rays. Keep your furry friend hydrated! Unlike us humans, dogs don’t have the luxury of sweat glands throughout their bodies. Instead, they regulate their temperature by panting, which helps circulate the necessary air through their body to help cool down, and they do sweat through their paw pads. Because of these mechanisms, dogs are much more prone to overheating than people are, making dehydration a very serious risk for your fluffy child. Reduced energy levels and/or lethargy. Ensuring proper hydration and a clean diet is a key to preventing dehydration, especially during these warm summer months. Different dogs have different needs based on weight, breed, and level of activity. On average, a healthy dog drinks about ½ to 1 ounce of water per pound of body weight per day. Be sure to always have water when you go on a walk or out to play with your pet! If you find that your furry companion is unwilling to drink enough water to stay properly hydrated (as is often the case with more stubborn breeds *cough Weimaraner cough*), you can always give them an ice cube or homemade frozen treat to entice them further. Just be careful not to overdo it with these frozen delicacies as the cold can sometimes cause bloating and discomfort. 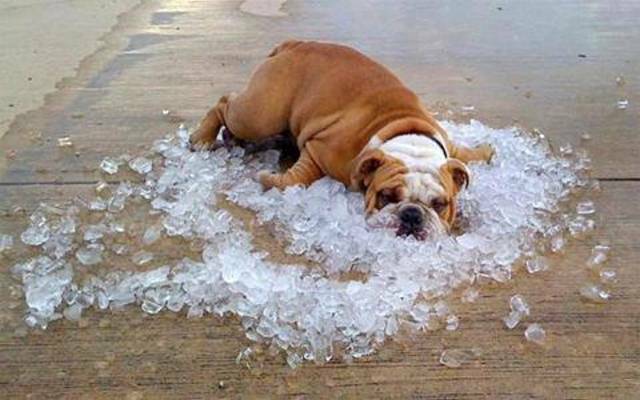 Most of the time your dog will find its own way of keeping cool. Dogs don’t only dig to find food or old hidden toys, they use the cool dirt to find some solace from the hot sun. And hey, they also have a lot of fun digging so why not let them? For dogs who love to swim, playing in the water has many benefits. They get the exercise and stimulation they need, and it is a great way to keep them cool in the summer heat. Taking your dog on hikes or walks where there are streams for them jump in is a great option. Even if you just have a kiddie pool in the backyard while they are playing helps a ton. If you can’t walk your dog in the early morning or late afternoon try using dog boots. Dogs can benefit from wearing boots in the summer heat when the pavement or cement is scorching hot. Heat rises from the pavement and cement and your dog absorbs and releases heat through their paws. If the pavement is too hot for your feet, it is most likely too hot for their paw pads. Offering this protection may be a little challenging for some dogs, but making sure it is a positive experience from the beginning will help (offering a treat or two won’t hurt). Even if you think you will only be a few minutes in the store or wherever it is you are going, never ever leave your furry friend in the car. Temperatures rise quickly in a closed car even with the windows cracked. Your pet could sustain brain damage or even die from heatstroke within 15 minutes. There you have it! By implementing these easy tips, you’ll keep your pet protected and be able to rest easy knowing that they will weather the summer months with ease.